(Toronto - May 16, 2018) - Ontario Monitor using their database of Hansard (the official record of the Ontario Legislature) 30,000 plus speeches from the last full year (2017) that the Ontario Legislature sat has generated some interesting metrics. While the data makes no claim to measuring the quality of Members of Provincial Parliament contribution it does indicate the volume of their contribution. 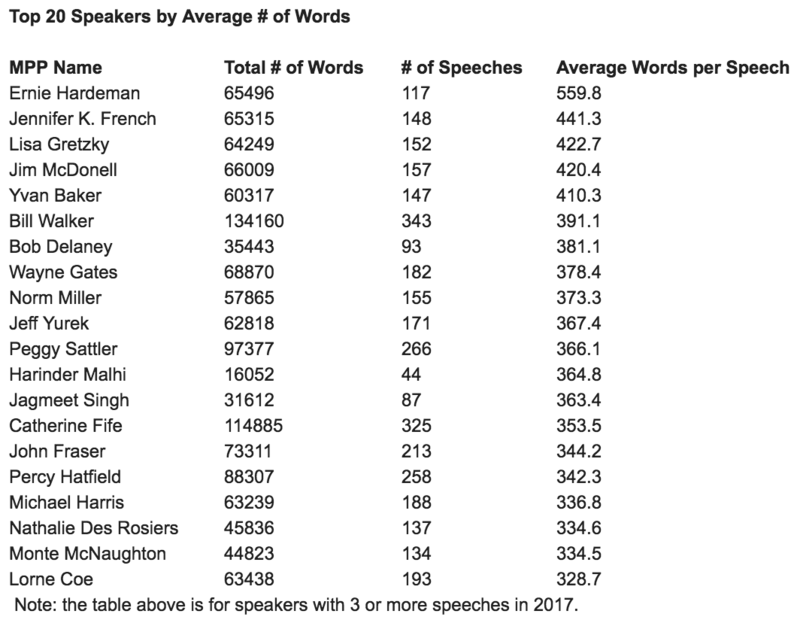 Some of the interesting data generated by Ontario Monitor, showed that in the Ontario Legislature in 2017, the 5 top speakers (by word count) are: 1. France Gélinas MPP Nickel Belt (NDP) 2. Bill Walker MPP Bruce - Grey Owen Sound (PC) 3. Catherine Fife MPP Kitchener-Waterloo (NDP) 4. Victor Fedeli (PC) 5. Peggy Sattler, MPP London- West (NDP). 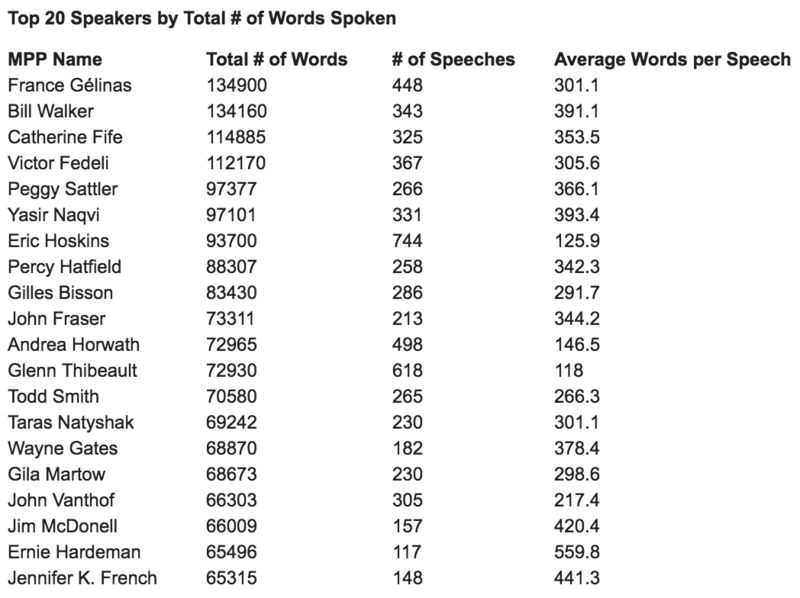 The MPP with the highest average number of words per speech (table below) was Ernie Hardeman MPP Oxford (PC). The top three speakers by total number of speeches are: 1. Kathleen O. Wynne 2. Eric Hoskins and 3. Glenn Thibeault. OntarioMonitor is a keyword-based email alert service and research suite for Ontario Hansard, bills, regulations, committees and much more. OntarioMonitor is an entirely cloud-based service that gathers a wide variety of government information (Hansard text, Media releases, Legislative Bills) then considers your selected keywords. When your keyword matches occur, Ontario Monitor sends you an email alert with the relevant parts of the legislation change, speeches or media release and the keyword highlighted to your phone or email. Ontario Monitor has operated since 2011 with a free trail available at http://www.ontariomonitor.ca/sign-up.php. For additional information contact: info@canadamonitor.ca. The information above was tabulated based on OntarioMonitor.ca's database of Hansard speeches in 2017. Administrative speeches (e.g. the Speaker) have been removed and not counted towards the totals above. Speaker totals were aggregated based on the names as provided by the clerks who drafted the Hansard transcript and occasionally there is a misspelling that would result in undercounting a speaker's speeches, although the effect on the totals should be minimal. The total above also exclude speeches in Committees which are very significant for some MPPs so the numbers shouldn't be taken as a numerical assessment of an MPP's involvement in the legislative process. In 2017 there were approximately 30,500 speeches in the House.